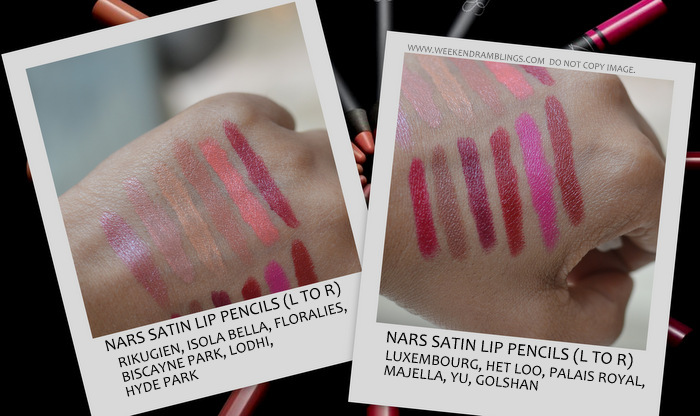 This season, NARS dresses up lips in the new Satin Lip Pencils. Drenched in decadent moisture for an ultra creamy finish, 13 statement shades smolder with rich pigments. Created by founder and creative director Francois Nars, the satin lip pencils combine the convenience of a pencil with the application of a lipstick in a jumbo-size crayon design. The new NARS Satin lip pencil are available in 13 shades and feature a creamy finish and tons of pigment. Here's a look at the swatches. Because of the creamy finish to the lip pencils, there is some amount of light reflection off the swatches, but hopefully, these help. All swatches taken under natural lighting, no flash.